Yesterday was a dark and stormy day in Maryland. Yes, rain fell heavily, but even more dark & stormy than that. A very dark day indeed, for a state that prides itself in its "green-ness." Why so dismal & disheartening, you ask? The powers-that-be over at the Baltimore Sun have spent a bulk of the summer planning and prepping for what they perceived to be a rock-solid/stellar idea; an idea that culminated yesterday. That idea? They have opted to shut down the time honored Baltimore Sun tradition of their Outdoor column. For the last 11+ years, Candus Thomson has been running that show...and doing an amazing job of it. She has brought enlightenment, enthusiasm, wit, wisdom, and awareness to all of us in Maryland regarding all that is the Outdoors. (See also Sad But True ~ The Baltimore Sun Ousts Outdoors Girl and Outdoor Section Be Gone). Gone will be tips, tidbits, and late breaking news detailing the Chesapeake Bay. Gone will be all of her insight and adventure-news for the hikers, bikers, kayakers, anglers, hunters, campers, and outdoor enthusiasts. Oh, supposedly the Sun will still have a once-a-week blurb, and even an outdoor activities calendar. But news feeds and random commentary from "Mr. Joe Sporadic Writer" will do nothing to speak for the Bay and its needs (not to mention the longevity of knowledge) like Candus Thomson could. So Candus Thomson's final article posted yesterday, August 14th, 2011: "Headed Off Down a Different Trail After Memorable Adventures." She sends out a fond farewell as she heads over to the metro desk for Howard County (which in my opinion, is a waste of her talent and expertise, but apparently no one asked me). Take time, pay tribute, and read Candus' article. Candy, I send you my best and have learned so much from you. Thank you for all your years of sharing your outdoor expertise. I've seen kids eyes light up when you share your stories. As a teacher and environmental educator at a Maryland "Green" School, I think the Baltimore Sun is making a grave error with their decision to move you from this post you've held so high. I think their priorities are off-kilter in a state that values the outdoors. My hope is that the "powers that be" will wake up, and bring you back to us in this capacity that you do so well. Godspeed! Heavy sigh...it's all still bumming me out. Perhaps what I need to do is concoct up a toast, in honor of you, Candus, and the loss that hits us hard here in Maryland. Perhaps a "Dark and Stormy" seems like the perfect libation to pay my tribute to this dark and stormy new world we Marylanders now live. Not sure what a "Dark & Stormy" is? That's why we have the Internet. Check it out. Use the keen, deductive skills that a journalist would use. That Outdoors Girl would use. Cheers, Candy! I know you'll do a bang-up job over there in Howard County, but the whole of the state of Maryland will miss you and all you've given us and the Chesapeake Bay. 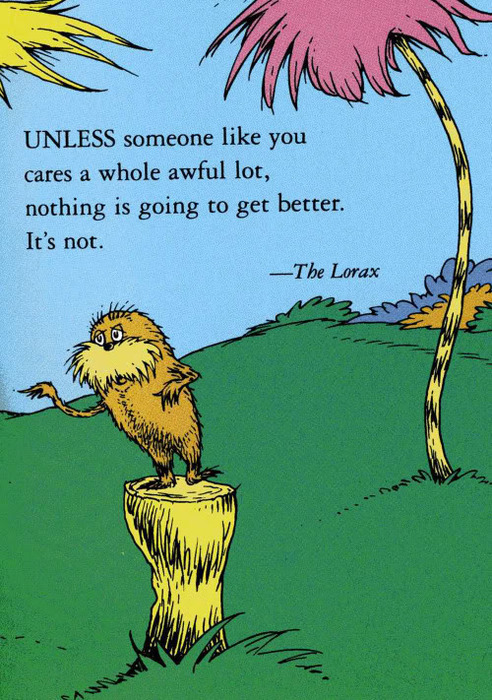 Thanks for being the Bay's Lorax.